Biopharm Australia are excited for the return of the FASAVA to Australia. The Federation of Small Animal Veterinary Association Conference will be held from Friday the 11th of August to Monday the 14th of August. It has not been held in Australia since in Sydney in 2007, hints the excitement. This day next week we will be in the Gold Coast Convention and Exhibition Centre preparing our stand for the conference which 1,700 delegates are due to attend. 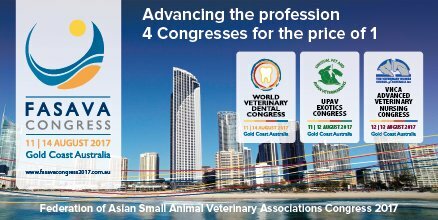 The 2017 FASAVA is four conferences wrapped into one The largest small animal congress in the Asia Pacific Region will hold The World Veterinary Dental Congress, The Unusual Pet and Avian Veterinarians Exotic Congress and The Advanced Veterinary Nursing Congress over the four days. We are looking forward to meeting some new faces and seeing some familiar ones from the pass AVA Conference and the Bain Fallon. If your are attending be sure to call to Stand 111 to say hello. We are also happy to take any feedback and any answer questions that you may have about Cartrophen Vet and Cartrophen Equine Forte. As always we have lots of goodies to give away and this year for the special event we are also going to be giving away three iPads. To stay up to date with photos and news at the Conference follow us on Twitter and Facebook.